Up to now a project on VersionEye was always a representation of 1 single file. For example the Gemfile. So if you wanted to monitor all 3 files you had to have 3 projects on VersionEye. Now a project on VersionEye can have multiple files! If you click on a Gemfile in our GitHub integration, VersionEye will check if there is a corresponding Gemfile.lock in the same directory. If so, it will parse that Gemfile.lock as well and create a new project with 2 files. 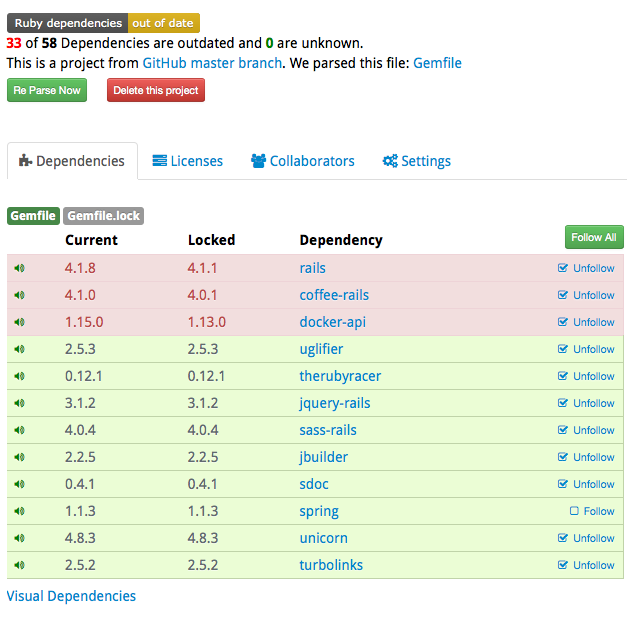 In the dependency tab, the corresponding files are displayed above the dependency table. In this example the Gemfile is selected and we see the dependencies of the Gemfile. 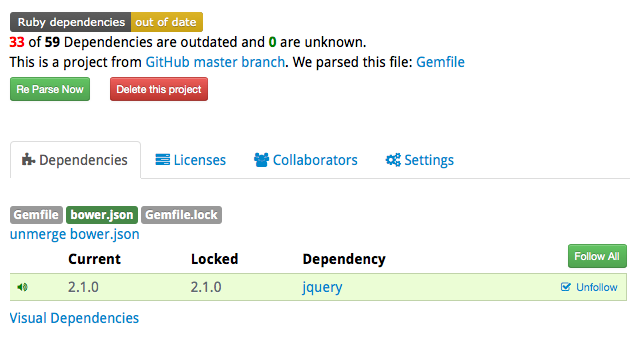 By clicking on the Gemfile.lock we can switch to the dependencies of the Gemfile.lock. It’s all in the same project view. The overall numbers in the head of the page are summed up from all files in the project. That means over the 2 files there are 58 unique dependencies and 33 of them are out-dated. Also the dependency badge is summed up over all files. The dependency badge only turns green if ALL dependencies in ALL files are up-to-date. Here we can pick a “parent” project to merge in. 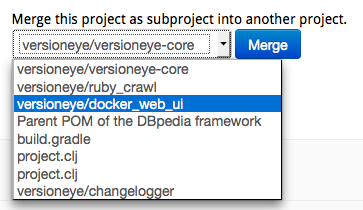 By clicking on the merge button the current project will be merged as subproject into the selected project. Now we have a project with 3 files. Gemfile, Gemfile.lock and a bower.json file. The overall numbers are updated. Overall 3 files we have 59 dependencies and 33 are out-dated. Under the file names there is a link “unmerge bower.json”. By clicking on that link the bower.json can be unmerged from this project. That means it will be removed from this project and be again a seperate project. Let us know what you think about this feature, either here in the comments or on Twitter. Up to now VersionEye sent out one notification email for each of your projects. That was not the best solution, specially for power users with 100+ projects because they got A LOT of emails. The new version only sends out 1 single email with a summary. Assume you have 100 projects in VersionEye. 50 of them are monitored daily, and the other 50 are monitored weekly. In that case you receive now every day just 1 single email with a summary about your daily monitored projects. That looks similar like this one here. The Dependencies column shows how many dependencies in the project are out-dated and how many are unknown. The Licenses column shows how many dependencies violet the license whitelist and for how many dependencies VersionEye doesn’t know the license. 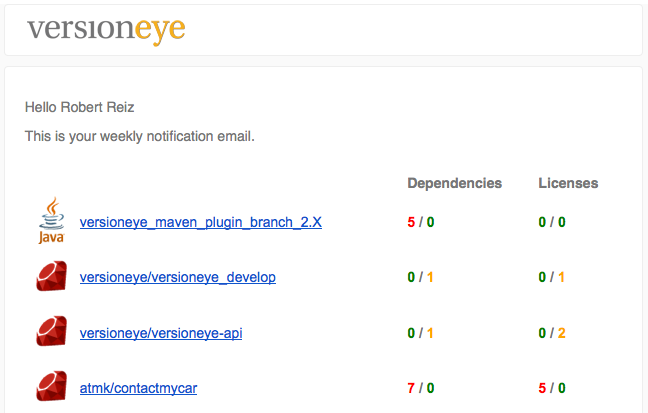 By clicking on the project name you come to the project detail page on VersionEye, where you can see all dependencies of the project with more details. Now you get less emails and a better oveview.